My days tend to be fairly simple, not a lot of appointments or a strict schedule to adhere to, but I still have plenty of little tasks I’m always trying to stay on top of. If you’re anything like me, you don’t necessarily need or want a calendar program that has you schedule a time for watering the plants or walking the dog, but you still might want some kind of regular reminder to get Fido his exercise, and that’s where Daily Deeds come in. 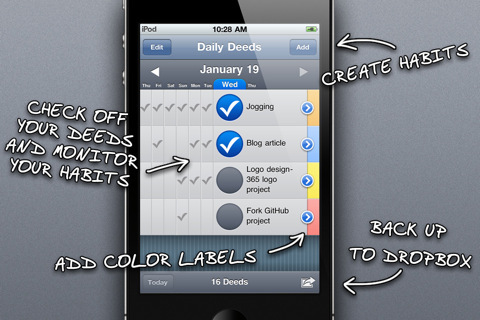 An extremely simple task management app, Daily Deeds is less a calendar system as it is a more grown-up version of a chore chart. To use, first add a “habit”. A habit can be anything you like, from “wash the dishes” to “work on evil robot death ray”, but that habit will show up on the daily calendar with an empty circle next to it. Tap to fill in the circle once you’ve completed the task for the day, and over time you can monitor your activity and get a better sense of your progress. You can add and color code multiple habits as you like. You can decide whether to update your progress daily or fill it in after the fact, but the main page will only display the last six days at once. You can get an idea of which activities you’ve been keeping up with and which ones you’ve been slacking on within the week, but you can also select individual habits to see how your overall performance has been by the month. By no means is this the prettiest app around. Its minimalist interface and very basic design scheme is inoffensive, but not particularly eye-catching. In terms of function, however, I did appreciated the less is more approach. In most cases, everything was very clear and intuitive, and I liked the built in Dropbox backup capability, but minor details, like the inability to swipe to rapidly switch calendar pages, were a little annoying. Also, small buttons combined with a fixed portrait orientation made for an overly cramped workspace. Of course, my biggest complaint is about its inability to schedule non-daily tasks, which I recognize goes against the core concept of “daily deeds”, but there are lots of minor tasks people really only want to do two or three times a week, like, say, go to the gym. Of course, you could always add “go the gym” and just leave the circle unchecked a few days a week, but it’s an inelegant solution. I was also surprised at the lack of optional alarms or Push notifications, since I would think an actual reminder is a natural fit for a program like this. Overall, it’s a simple app that performs a simple task reasonably well, but it lacks a few bells and whistles that would really make it shine. 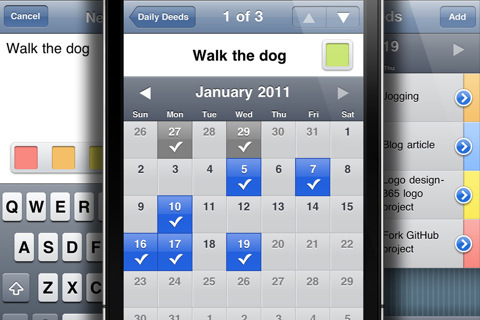 AppSafari review of Daily Deeds was written by Tracy Yonemoto on February 11th, 2011 and categorized under App Store, Calendar, Notes, Productivity. Page viewed 5515 times, 1 so far today. Need help on using these apps? Please read the Help Page.